How to Scare your Socks off! | Sailing With Albie! 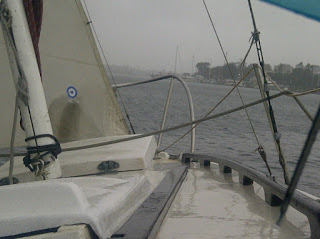 Today I want to share with you how to go sailing in Southern California and scare your socks off! Ripped sails after sailing in a storm. One Saturday afternoon after a nice sailing trip, a friend said to me, “What can be so exciting to write about on your sailing blog? “Ok, that’s a fair question! I mean, its definitely not Cape Horn with 40 knot winds almost every day and thirty foot waves – right! 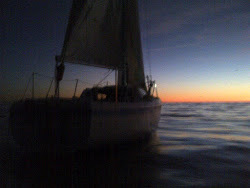 To the ordinary sailor in Southern California, we get good weather most of the year and if your like most, you plan your weekend to go sailing in the afternoon when the wind is usually fresh and there’s plenty of light. And that’s usually fun! But due to some unusual circumstances and some really bad luck, I found the key to high adventure – right out of my harbor! So this evening, as the sun was going down over the water and the wind was pushing my sails firmly to port, I recognized what those things were and thought you might enjoy knowing – even if you wouldn’t want to copy them! 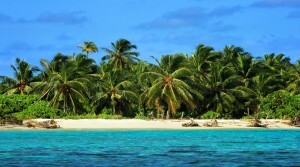 First, if your looking to increase your odds at finding adventure, sail at least once a week at night. adventure at least ten percent. I mean, here’s a good example. 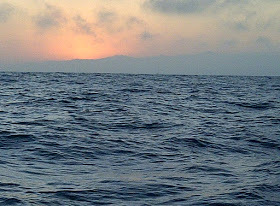 Tonight I did not really have any weather problems, the wind was steady and the waves were normal. As I was sailing back towards the harbor from out at sea, suddenly I was frightened out of my mind by what sounded like a lady crying out in pain or my dog being run over by the boat! It honestly sounded a little different than a human voice but nonetheless freaked me out! Thankfully it was neither as I was alone and my dog was safe and happily sleeping in the V-birth. But here’s the question. What WAS it? All I can guess was that I must have scared a sea gull or a seal. I’m also pretty sure there was no one swimming there too! They would have been sure to of seen my navigation lights or yelled out for help. Okay, so what adventure would I have had if I hadn’t gone out at night? Probably none. I guess its not exactly a positive thing to happen for the seal or bird but it sure was weird! I’ve gone out at night for three years and never had anything like that happen. Birds and seals are usually very aware of what’s happening – much more than you or I. So I’m still honestly unsure of what it was. But it was a tiny adventure non the less. And this brings me to my second insight. Second, do NOT use your engine for any reason except for emergencies. This alone will take ten years off your life! But after you get good at it, watch out because it gets exciting and it has its benefits. For one you are forced to become a much better sailor. Third, sail each and every week in whatever weather may come your way; ie…calms, storms and what may. After a year of this, you will have some hair raising stories! Just be really careful, as you will no doubt have some adventures you may not want! When sailing at night, always make sure you have navigation lights and a couple flashlights handy, an extra lantern and a fog horn. After escaping being run down by big party boats many times, I’m glad to tell you one of these will help save your life! One night I put out my lantern, flashed my lights, turned the boat so my navigation lights were obvious and the party boat still didn’t see me! So I finally blew the fog horn a couple times and that worked! Thank you God! Now if the fog horn did not work I could have gone on my VHS radio and hailed the boat on channel 16 and then used my oars to seriously get out of there! I know, yes you would have put on your engine by that time. But you would have never learned that rowing a twenty foot boat and larger is actually possible and will get you somewhere if you’re persistent. Really when you think about it, I would never had that problem if I was using my engine in the first place and wasn’t sailing at night. 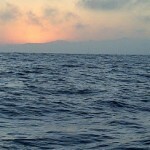 Its true that a temporary calm put my sails out of action and slowed me down to almost a standstill. So you say, how fun is that? What can be learned by such foolishness? Well, I’ll tell you. One of the first things I learned after losing my engine, was that the wind becomes fickle after sunset. It sometimes takes half an hour to an hour for it to come back – but it usually does.
. So this means that if your not using your engine – make sure you get back before then! Now how did I learn this lesson? By sitting patiently for endless hours without wind is how! So you must be thinking, ‘isn’t it just better for you to learn from reading my mistakes? Now that I know this, I can still use my engine – right? Well, not if you want to learn how to sail in very light winds and how to save your life if your engine DOES ever happen to fail. I’ll tell you, one year on a nice evening, the wind started kicking in and gusting and I did what every normal sailor does and took down my sails after getting safely into the harbor. My engine then proceeded to die and for the life of me I couldn’t figure out why. So what to do now with the wind gusting twenty knots down the channel and with the inevitable just waiting to happen! I needed to figure something out fast! Well I tried raising my sails, but I couldn’t get into the wind like I wanted and with the gusting winds, the mainsail just got stuck. So did the jib. 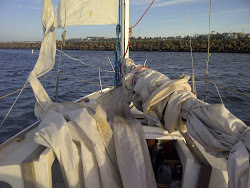 You’ll be happy to know that even with the mainsail three quarters up and the jib only up partially, I was able to crawl away from hitting the docked boats and get back to my slip. But it was scary and REALLY stressful! 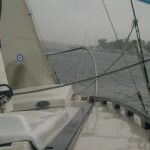 Now from plenty of practice, I know how to sail into my slip even in a storm and using an engine is just one more plus. Make sure your navigation lights are working and have a backup manual set. Know the ‘Red Right Returning rule and your buoy and harbor entrance lights. I’d say its pretty important to know coastal navigation too. But for sure its MANDATORY to go out with someone who knows what they’re doing first, as its really easy to get lost at sea at night and not know where the harbor is. And sailing in fog is a whole different monster. Now about going out in storms, my first advice after having been in several of them is to carry storm sails. A storm jib is a good beginning. Second, have safety harnesses available to clip into when it gets rough. 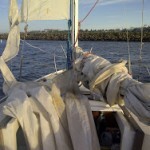 Attach a safety line from the bow to the stern in which to clip the harness onto. Third have a good boat with a good keel. Have safety lines running around it from bow to stern and learn all you can about heavy weather sailing from books and video’s before you do. My final suggestion is to go one step at a time and if you get scared – really scared, turn back. Of course it’s good advice to have someone go with you who knows what they’re doing – but good luck finding them! Now if you’re seriously reading this and are going to do what I said, than you are definitely crazy! I only do it because I love sailing at night and because I lost my engine in a big storm and I want to be ready and know what to do when the worst happens. If this article really challenges you to try these things please realize that there is a lot of risk and that it can be dangerous. Just read some of my stories – you will see! To tell the truth, I learned all I have (which is not much compared to some) by lots of mistakes. IT’S THE MISTAKES THAT TEACH YOU BETTER THAN ANYTHING ELSE! some mistakes can be costly. So these are the three ingredients to making yourself a real adventuresome soup. 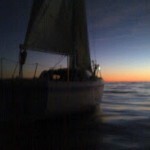 If sailing in storms and without an engine are too much, try just sailing at night! There’s nothing like it! The sea is so dark and mysterious – that alone will scare your socks off the first few times! I remember having this fearful feeling that after having just gone out to sea that the boat would just sink. Lol! I feared that the keel would find a way to come off or something bad would happen! Exactly my point. When you come back and all is well, you’ll thank me for a real adventure! If you liked this story, subscribe so you can hear the next hair raising tale! Want to hear more sailing stories?